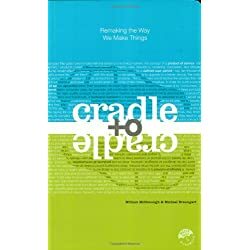 As I think over the recent past, the biggest “eye-opener” was reading the book, “Cradle to Cradle” by William McDonough. The book was a delightful surprise. I read this book after watching the author’s TED Talk. You can watch it , too, if you click here. I had recently started to visit TED.com regularly, and I challenged myself to watch something once a week from someone I had never heard of, and in a subject area I was not familiar with. I like to think of myself as someone who is a thinker, a “creative”, and open-minded in my search for information. It seemed that I should put my time and attention where my mouth was! For some reason, I decided to take a chance on his talk. He is not flashy or particularly charismatic as a speaker. However, his quiet intensity and his vision for the world drew me in as if by a magnet. I won’t try to explain or summarize his talk, because some of the tags or buzz-words might cause you to have a stereotypic view of him or his subject — either rejecting it out of hand, or assuming you already know all there is to know about the subject. I WILL say that, after seeing the TED talk, I leaped (yes, leaped!) out of my chair and said, to nobody in particular: “Why doesn’t EVERYBODY know about this???? ?” I began telling almost everyone I know about the video. Their eyes glazed over. Good thing I am sort of used to that. . .
My partner and I host a book salon in Houston, TX, and shortly after we found the TED Talk, we chose this book as the monthly selection. The book is made to be completely recycleable. That tidbit will make more sense after you watch the video. Cradle to Cradle opened my eyes to the fact that even though HUGE problems may seem to be looming on the horizon — it is possible that most people are completely unaware of them. Even more importantly, I learned that there are people who have it covered. People who are creative, dedicated, brilliant, and who are working on solutions. We need to let them DO IT. It also opened my eyes to an obvious realization: if the methods I already know about have not solved a particular problem — they probably won’t. I am increasingly open to the notion that a solution will be in a direction I have not explored. In other words, the solution is most likely something I don’t know about — YET. Unknown, new, never-been-tried-before — What better reason to keep learning? The biggest outcome from this eye-opening has been the creation of an almost insatiable appetite for new ideas: Ideas that are positive, constructive, active, and solution-based. My best advice? If there is an event like TED in your community (Houston has The UP Experience and TEDxHouston, along with numerous other lecture series), give yourself a gift and go to it! Go to it ESPECIALLY if you think it is outside of your area of expertise. You will meet some wonderful people, you will be inspired, and you will take new and intelligent actions in your own life. Go get ’em. MaryBeth D. Smith is the Founder and Director of The Feldenkrais Center of Houston. She is a nationally-recognized expert in the area of natural performance improvement for performing artists and athletes. With over 20 years experience teaching in business, university, and community settings, she now uses the Feldenkrais Method to help people improve their self-image, function, and enjoyment in movement and in life.